I get very excited about tinkering with electronics and things that move, light up, make a noise or generally just respond to my inputs. A project which I have looking to do for a long time now is to build a robot which will be following a line on a track (a line follower robot). 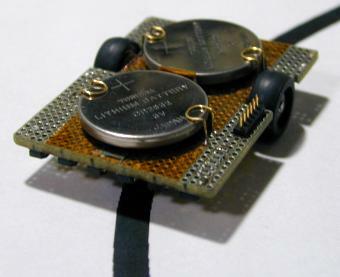 To build a autonomous vehicle which will move along by following a track. To keep it simple (since this will be my first REAL autonomous machine that I will build) the track will not cross anywhere, but it will need to perform a few functions during it’s navigation around the track. So the objective is for the robot to complete a random track (not crossing anywhere) in the fastest possible time. If there are any gaps (markers of 10mm long gaps in the track) it must be counted and the number of gaps must be updated and displayed on a seven segment display. After the track ends, the robot should stop by itself and store the ‘lap time’ in memory. The idea is not to use any development kits like +Arduino or +Mindstorms EV3 , so a PIC microcontroller will be used. In fact any controller can be used. An +Atmel Microcontroller will also do very nicely. So, as you can see, line follower robots can be bigger or smaller depending on the application and design parameters. This is a concept that posed a hurdle for me when I was a student. Math papers always say: “prove from first principles that…” followed by some theorem that was thought by some clever guy in the 1800’s. Other times, it is said to design a circuit or something from first principles. For maths and physics this means to provide the answer based on some basic laws or rules. For example to show that power = volts x ampere from ohm’s law. In engineering and design, it simply means to follow logic steps and state what will work and will not work during the design process. I will try to follow this thought pattern through the design of this simple little robot.